Local communities can help preserve the benefits provided by ecosystems, such as food and water production, carbon storage, and flood control. Photo credit: ADB. At a study session of the Politburo of the Chinese Communist Party’s Central Committee in May 2013, President Xi Jinping said: "We have to understand that to protect the environment is to preserve our productivity, and to improve the environment is to develop our productivity. Such concepts should be deeply rooted." This sentiment reflects the shift in development goals of the People’s Republic of China (PRC) toward an "ecological civilization" a policy concept initiated by then President Hu Jintao in 2007. Almost 4 decades of rapid growth has lifted hundreds of millions of people out of poverty and made the PRC a world economic leader. Yet it has come at heavy environmental costs. Most countries in Asia and the Pacific are following a similar path, wherein short-term extractive economic growth (to meet the immediate livelihood concerns of citizens) has trumped longer-term environmental sustainability. Past successes and current challenges of the PRC in pursuing green growth have major implications for the world. For one, experimenting with eco-compensation (short for "ecological compensation") has become an important policy concept and buzzword in the country, encompassing fundamental reforms in environmental management and innovative approaches, such as market-based policy instruments. 1. How did eco-compensation begin? The term is specific to the PRC and broadly refers to a range of potential policy directions and approaches to environmental management with the goal of improving outcomes by taking into account the costs and benefits of environmental goods and services in economic activities. Eco-compensation was first used in 1993 to denote a fee for environmental agencies. This changed after the launch in 1999 of the world’s largest payments for ecosystem services, the Conversion of Cropland to Forests Program. Its sheer scale created significant local-level momentum and capacity building across the country. It sparked debate on innovative approaches to conservation and spawned other policy experiments, many of which were labeled as eco-compensation. In 2007, then State Environmental Protection Administration (now Ministry of Environmental Protection) identified four targets for eco-compensation pilots: nature reserves, key ecological function zones, mineral development areas, and watersheds. It said pilots should follow the principle of "the developer protects, the damager rehabilitates, the beneficiary compensates, and the polluter pays." fees charged to those who pollute the environment. 2. What kinds of programs and policy approaches does it cover? The internationally popular policy instrument, payments for ecosystem services, is arguably the most closely related to eco-compensation. Schemes generally consist of negotiated contractual arrangements between those who provide and those who benefit from ecosystem services, with payments conditional on the protection and delivery of targeted services. increases in compensation from the central government to less developed western regions for past and current extractive and environmentally damaging resource uses as part of the country’s economic development. Most programs focus on water resources management and use of financial mechanisms (e.g., subsidies, payments, fiscal earmarks, penalties, and rewards) to address management gaps. 3. What policy directions does it represent? expansion and diversification of funding sources, via more direct engagement of a wider range of key stakeholders and economic actors, to improve the sustainability of financing for conservation and environmental management. As a large-scale policy platform and concept, eco-compensation appears to be part of a larger drive toward environmental fiscal reforms in the country. This involves improving environmental management and regulatory structure to better incorporate the costs and benefits of environmental goods and services in economic activities. 4. What is the status of eco-compensation legislation in the PRC? Eco-compensation has featured in the last three 5-year plans of the country. The 11th Five-Year Plan (2006-2010) called for innovation in environmental policy, the launching of pilots, and for policymakers to accelerate the development of related mechanisms. Both the 12th Five-Year Plan (2011-2015) and the 13th Five-Year Plan (2016-2020) identify the further development, application, and monitoring of eco-compensation as a high priority to achieve the broader “ecological civilization” agenda. Over the past 20 years, numerous policy documents and laws specifically mention eco-compensation. These include the Forestry Law of the People’s Republic of China (1998), the Water Law of the People’s Republic of China (2002), Decision of the State Council Regarding Using the Scientific Development View to Strengthen Environmental Protection (GF  No. 39), Decision of the Communist Party of China Central Committee on Several Major Issues to Construct the Socialism Harmonious Society (ZHF  No. 19), Opinions of the State Council on Strengthening Key Works of Environmental Protection (GF  No. 35), and the amended Environmental Protection Law of the People’s Republic of China (2014). As of November 2016, the Standing Committee of the National People's Congress has issued a total of 16 laws related to eco-compensation, while the State Council has issued 91 regulations and policies as well as 277 departmental rules. 5. How is it changing the environmental management and regulatory regime? There is greater adoption and use of outcome- and incentive-based policy and fiscal approaches to promote equity in development and to effectively balance conservation of ecosystems and natural resources with environmentally sustainable socioeconomic development. Eco-compensation is increasingly being positioned as a funding mechanism for the protection and maintenance of ecosystem services and niches of key ecological function zones in the 2010 National Main Function Zoning Plan. An opinion issued by the State Council in May 2016 identifies seven key ecological function zones—namely, forest, grassland, wetland, desert, ocean, waters, and cultivated land. By promoting eco-compensation in areas where development is restricted or prohibited, the National Main Function Zoning Plan encourages the subnational governments concerned to focus on green growth rather than the traditional development model. In this context, eco-compensation can serve to more equitably distribute the benefits of national economic growth to poor rural areas. 6. What are key examples of eco-compensation? Three programs show how eco-compensation mechanisms are being developed and refined. This is the world’s largest payments for ecosystem services program. It is innovative for making direct payments to households to retire and afforest marginal and sloping rural land. Targets include watershed ecosystem services in the upper watersheds of the Yangtze and Yellow rivers, biodiversity habitat, carbon sequestration, and rural welfare improvement. The program has now retired more than 26 million hectares of land and involves 32 million rural households. The central government continues to improve its design, implementation, and outcomes. Lauded as the country’s first cross-provincial eco-compensation program, the scheme protects and improves the water quality of Thousand Islands Lake Reservoir in Zhejiang province, to which Anhui province’s Xin’an River is a key tributary. Launched in 2011 with strong national support, it invested in basic water management in Anhui and then established an incentive-based mechanism. Results of annual assessments of water quality improvements determine whether one province compensates the other to defray management costs (Anhui) or added treatment costs (Zhejiang). Since 2012, 452 municipalities and counties designated as key ecological function zones have been in a national pilot for what will be a nationwide system of fiscal rewards and penalties for regional environmental performance. This scheme tracks and monitors changes in environmental indicators for these pilot areas. The results determine annual fiscal penalties or rewards based on the Measures on Transfer Payments for National Key Eco-functional Zones issued by the Ministry of Finance and the Ministry of Environmental Protection. This is an example of an innovative national policy instrument that provides incentives for conservation and environmental protection at the local level. 7. What can the PRC’s eco-compensation experience offer international practitioners? National policy formulation and local-level experimentation have a long history of cross-fertilization in the PRC. For example, the Forestry Law of 1998 provided for a fund to support ecologically important standing forest area, which enabled Guangdong province to create the first of such fund. Conversely, a local water use rights purchase contract developed independently by two municipalities in Zhejiang province—Dongyang and Yiwu—brought about national discourse on water use rights transfers that resulted in national policy uptake. Large-scale programs, such as the Conversion of Cropland to Forests Program, span a wide diversity of socioeconomic and ecological conditions and often create diversity in de facto implementation regimes too. This constitutes a treasure trove of natural experiments that, with more systematic monitoring, documentation, and evaluation, could have great potential in identifying the impacts of specific program configurations (e.g., for payments for ecosystem services) on outcomes. The country’s large-scale programs have often been carried out with a goal toward generating momentum and scale first, and refining program elements later. This has potentially huge knock-on effects on capacity building and awareness raising at local levels. It also means that a solid foundation now exists upon which policy refinements can be introduced to improve outcomes and lower costs. It is very likely that the Conversion of Cropland to Forests Program would not have had the same impact today if officials had been overly focused on developing a perfect program before scaling up. 8. What does international best practice have to offer eco-compensation? Eco-compensation’s role as a broad policy platform for catalyzing environmental management innovation makes it a valuable entry point for a range of effective approaches used internationally. This approach helps developers achieve "no net loss" of biodiversity via the "mitigation hierarchy" of avoiding, then minimizing, and finally offsetting impacts. It holds promise for local governments and economic actors, giving them flexibility in mitigating ecological impacts, especially for eco-compensation in key ecological function zones. This involves the creation of platforms for stakeholders to pool and leverage financial resources and to develop institutions for joint planning and decision-making for improved watershed management. It is a valuable template for eco-compensation frameworks targeting watershed ecological services and water source protection, such as in the case of Fujian province’s programs for the Min, Jin, and Jiulong watersheds. These are a form of payments for ecosystem services that encourages farmers to adopt environmentally friendly and best management practices. Agriculture has surpassed industry as the most important source of surface water pollution in the PRC, and so programs and approaches to help mitigate impacts are greatly needed. This involves putting a cap on total pollution levels for a watershed, and then defining and distributing a set amount of pollution allowances that can be traded among polluters via a market platform. As the PRC’s pollution permitting system is refined and strengthened, this approach could help reduce pollution more cost effectively, and eventually be expanded to allow trades between point-source polluters and key nonpoint sources, such as agriculture. 9. How has ADB been supporting the development of eco-compensation? The Asian Development Bank (ADB) has been supporting the PRC’s eco-compensation agenda since 2009. It has provided technical assistance and loans to the national and provincial governments and knowledge support for the national eco-compensation legislative framework and technical guidelines. It has helped develop pilot programs at provincial and sub-provincial levels. At the central government level, ADB’s key partner is the Western Region Development Department of the National Development and Reform Commission, which coordinates the national eco-compensation policy agenda and framework. facilitated establishment of the country’s Eco-compensation Policy Research Center and Knowledge Hub—a platform for knowledge sharing and cross-learning with the international community on eco-compensation and relevant approaches. Conference participants have come from government agencies and regional governments in the PRC, neighboring developing member countries of ADB, research institutes, international organizations, nongovernmental organizations, and the private sector. Key stakeholders have acknowledged the value of these conferences in understanding the rapid development and pioneering of eco-compensation approaches in the country. Participants have requested ADB to continue to support this initiative for the benefit of both the PRC and other countries. Asian Development Bank (ADB). 2016. Toward a National Eco-Compensation Regulation in the People’s Republic of China. Manila. Bennett, Michael T. 2008. 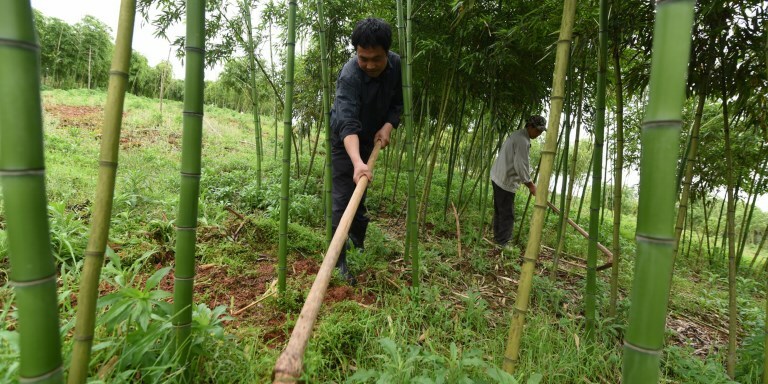 China’s Sloping Land Conversion Program: Institutional Innovation or Business as Usual. Ecological Economics. 65 (4). pp. 699-711. China Council for International Cooperation on Environment and Development (CCICED). 2013. CCICED Update. 31 May. CCICED Secretariat. China Daily. 2007. Opinion/Commentary: Ecological Civilization. 24 October. State Environmental Protection Administration of the PRC. 2007. Guiding Advice on Launching Pilot Ecological Compensation Projects. HUANFA No. 130. Zhang, Qingfeng and Robert Crooks. 2012. Toward an Environmentally Sustainable Future: Country Environmental Analysis of the People’s Republic of China. Manila: ADB.